The G-Carbon Series poles are available in 10.4mm and 12.7mm shaft diameters. The 12.7 G-Carbon Lite provides for a stiffer (less flexible) shaft than does the 10.4mm diameter shaft. Our patented pole design features thin "pencil" shafts for better balance and feel. G-Carbon composite poles are about 25-percent lighter and up to six times stronger than aluminum alloy poles, don't bend, are more durable, and have excellent feel and balance. Our poles are smaller in diameter, only 10.4 mm or 12.7mm vs. up to 18 mm and most shafts are the same diameter at the top and bottom. Our firm, flexible shafts take advantage of the natural shock absorption properties of the carbon blend. Lightweight, firm performance, but less "kick back" for better balance, and they're easier on hands, wrists, elbow and shoulders. And we're not just lightweight in the store, but we get even more lightweight during a long day on the slopes when compared to larger diameter poles that have more wind drag. Wind drag equals exponentially more weight the faster you ski. Lightweight poles simply perform better than heavy ones. 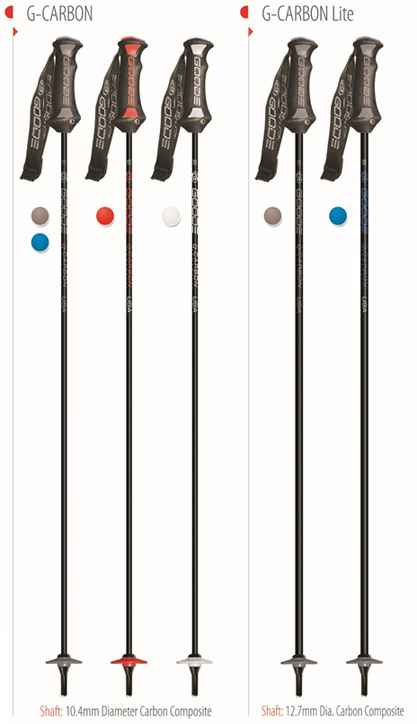 Click HERE to view a ski pole sizing chart. All Goode ski poles are warranted against defects in materials and workmanship for one year. These poles are "da bomb". I replaced a pair of poles I lost with this pair of Goode ski poles and I am really happy with them. They are so durable and lightweight. I like the way they feel when I am skiing fast. They seem to have less wind drag compared to my previous pair of poles. I highly recommend these ski poles. Second pair. Lost one pole from a similar 15 year old plus set in really deep powder. The new ones are the same top notch quality and feel. I really couldn't be happier with my purchase. I used to suffer from wrist and thumb issues until I tried your poles and now I am pain free. Best poles period! I never thought a ski pole would make such a difference in my skiing! You can really feel the light weight and less wind drag. Click the button below to add the G-Carbon™ Ski Pole to your wish list.